Would it just be easier to quit Twitter? That’s the question social media marketers are asking these days about the little blue bird. Not all that long ago, Twitter was a terrific way to interact with your customers, fans, and colleagues, as well as a solidly reliable method to create engagement around your own content. Only one of these is still true. No doubt, Twitter remains a conversation platform for media and influencers. And Twitter’s role as a customer service platform remains strong, partially as a result of positive functionality tweaks. But as a way to get new people to discover your content and read your blog post, or listen or your podcast, or watch your video? Nah. Twitter just doesn’t do that these days. New research from our partners at RivalIQ found that the average engagement rate on Twitter for brands is now 0.049%. That includes all likes, comments, retweets, etc. Every action but clicks. Thus, according to RivalIQ’s 2017 Social Media Benchmark Report, a tweet to 10,000 followers will, on average, generate 4.9 engagement behaviors. Per Dave Chaffey at Smart Insights, the average banner ad click-through rate is 0.05%. This means that Twitter’s engagement rate is actually less than the click-through rate for the much-maligned, often-mocked banner ad. Interaction rates in this vicinity do not mean that the tactic is pointless. Considering there are millions and millions and millions of dollars spent on banner ads every day, somebody is making a CTR of 0.05% pay off. Twitter, I suppose, is the same. A minuscule engagement rate hasn’t yet convinced me to pull the plug on the platform. For now, Twitter is worth it just for the personal interaction and customer service elements alone. However, big brand social media managers on my Social Pros podcast are consistently telling me that they are spending far less time on Twitter, and devoting little strategic muscle to the platform outside customer service. 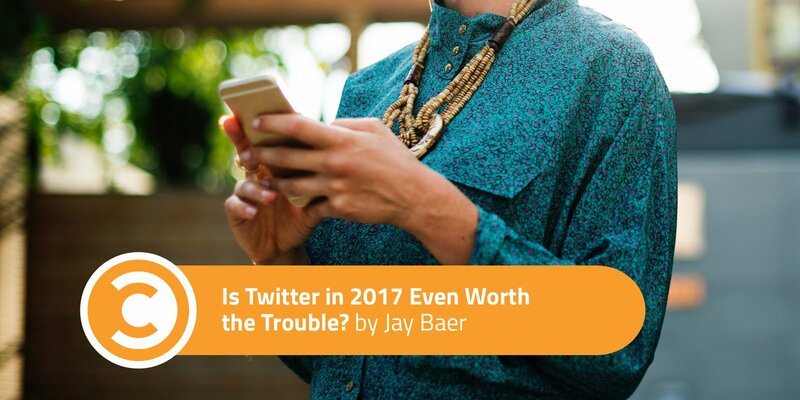 Further, almost no guests in 2017 have said that they are spending serious money on Twitter advertising, which exacerbates the underlying revenue issues at Twitter. I’m not saying it’s time to bail out. But I am definitely saying that if your social media strategy relies upon a lot of audience interaction and click generation on Twitter, it’s probably time for an overhaul of that strategy.